We are delighted to announce the launch of our newest tour – a craft beer tour of four city centre pubs in Aberdeen. Since 2010, Aberdeen has been making a name for itself as destination for craft beer lovers. On this small-group tour you’ll find out why that is, as we take you to four city centre pubs, linked to three independent craft breweries. The tour will be led by guide (and craft beer enthusiast) Rick and will be all about the history of craft beer, as well as the surprising, amusing and revealing tales of how these Aberdeen breweries developed. Of course, a craft beer tour would not be complete without sampling the beer itself. At each location you’ll get a 1/3 pint of a beer with a story to tell. We hope you’ll come away from the tour with some new favourites and some trivia to share next time you are down the pub. We'll be running one tour just before Christmas and one in January. Tickets are available now from our website and are £25 (including booking fee). But we want to keep this tour quite cosy and intimate so places are limited to 8 per tour. We're really excited about this new venture for SFT into something a little bit different for us and we hope to see some of you fans of beer and history along on the new tour. Even as a local, there are some things you miss out on in Aberdeen. I used to think that Techfest was limited to educational events for schools, with a heavy emphasis on Meccano and cuddly tarantulas. But over the last couple of years I have been to some brilliant events which have taught me how to survive in a zombie apocalypse, why true monogamy is impossible and how you can poison someone and get away with it (spoiler: you can't). As a convert to this celebration of science, technology, engineering and mathematics, here are my top picks from 2018's public program. Hope to see you there! N.B. Links to the booking page for every show if you click on the show title. I have to be honest - I love some grisly detail, hence why we run Crime Pays Tours. I was therefore very excited to see this offering on the program with recently retired pathologist Professor James Grieve and SPA forensic biologist Chris Gannicliffe. They'll be debunking some of the CSI-style depictions of forensics, as well as delving into how technology has had an impact on modern day forensics. Is it just me or is fermented food having something of a moment right now? Adrian Gomes of 10 Dollar Shake (the people who brought us The Tippling House and Rye & Soda) talks about natural methods for preserving food and drink. And if the educational side of things wasn't enough for you, you also get 3 cocktails and 3 canapes included in the ticket price. Cheers! Dr Matt Pritchard is a scientist and a magician. A scientist AND a magician. And a bloody good magician too - only one of 300 people in the world to become an Associate of the Inner Magic Circle. That puts him on the same level as Dynamo. He will be using magic to explore the ways that scientists and magicians have collided and collaborated over the years. Like most geeks, I love a pub quiz. And what could be better than a quiz combined with a cabaret? I have no idea how this will work but it sure sounds interesting. A pub quiz with a twist, promising unusual rounds like the 'Origami Olympics' and 'The Leaning Tower of Pasta'. Like the internet, we can't get enough of weird looking animals. But have you ever thought about why some animals look particularly unusual? This show sets out to explain why some animals look downright peculiar, alongside plenty of audience participation. Those are my choices for Techfest, but what have I missed? Share your recommendations in the comments. Thinking of popping the question this summer? This handy map from ROX has some top tips for where to buy the perfect outfit, choose the perfect ring and ask the dreaded question. We give our own take on their ideas and suggest some innovative proposal scenarios. Some say that Aberdeen was built on seven hills, like Rome. For many there ends the connection with the most rome(antic) city of all. But anyone who knows Aberdeen is aware than it can possess a beauty that would rival even the City of Love. So if you are thinking of asking her (or him) to say 'Yes', why not check out this map of suitable Aberdeen locations? We guarantee it is a less hackneyed proposal setting than Rome. Thousands of Aberdeen couples have met, falling in love and danced off into the sunset at the Beach Ballroom. A dance mecca since the 1929, why not celebrate your engagement by going for a spin on the amazing sprung floor? Why not plan a scavenger hunt at this beautiful beach, complete with clues that reference your relationship and a map leading him/her to where the engagement ring is buried. Only maybe substitute an plastic ring for the real thing. Loch Avon, Cairngorms. Credit Nick Bramhall. Of course, no proposal is complete without the engagement photos and social media post. Be careful though that the breathtaking scenery of the Cairngorms doesn't steal the limelight! Craigievar Castle. Credit Nick Bramhall. Supposedly the inspiration for the Disney castle, you couldn't have a more fairytale proposal than getting engaged at this stunning pink castle. Is Dunnottar Castle one of the best backdrops for wedding photos ever? Yes. Is it also a right pain to have to climb 140-odd steps on your wedding day? Yes. Get the proposal pics at Dunnottar so you can go easy on your big day. Think my ideas are a pile of piffle? 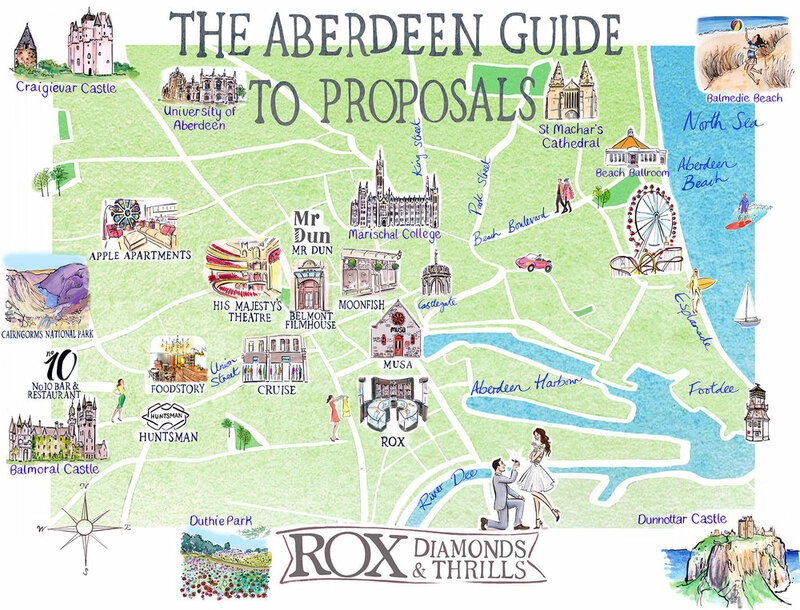 Where would you suggest getting engaged in Aberdeen? Share your ideas in the comments below. Tips for around and about Aberdeen. Staying at Aberdeen Youth Hostel? Go for a walk around Queens Road and see if you can spot these hidden gems.